Tall Tales have an honored place in American culture. 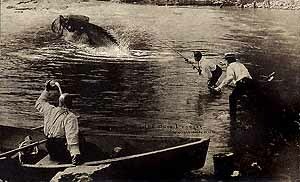 From Paul Bunyan and King Kong to the legions of fishermen boasting about "the one that got away," there is something about exaggeration that appeals to our sense of national grandeur. Perhaps it's also our view that in the modern world, anything is possible. Giant hybrid crops? Sure. Rabbits the size of Buicks? Well--maybe. Exactly this formula proved the key to oversize wealth and success for a photographer named William H. "Dad" Martin. 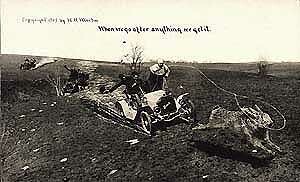 In 1894, he took over a studio in Ottawa, Kansas. 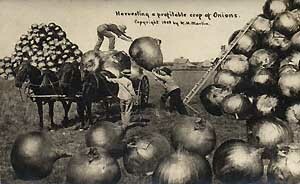 Martin began using trick photography in 1908, producing a series of wildly exaggerated post cards. These were so popular that he sold his studio the next year to concentrate on the post card business. Within three years, Martin's trick photos earned him a fortune. Demand was so strong that his firm reportedly purchased photographic emulsion by the railroad tank car-full (or was that another tall tale?) Martin sold the business in 1912 and founded the National Sign Company. So far as we know, he never again ventured into the darkroom. But during his brief career as a post card photographer, "Dad" Martin tapped into the national psyche with his own imaginative brand of homespun surrealism. Click on any image or title below for a larger version and more information. If you have a fast connection, click here to begin. "When we go after anything we get it." 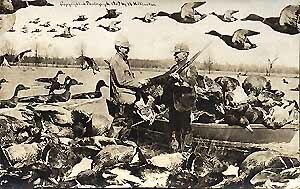 The message penned on the back of this card reads: "Did you ever have a dream like this?" 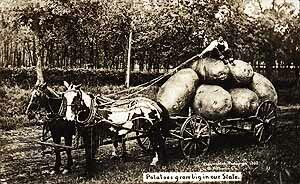 "Potatoes Grow Big in Our State"
"'Salted.' So easy. Put salt on their tails." 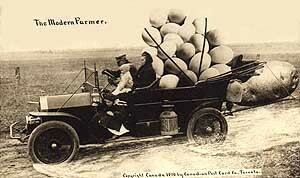 "How We Take Our Geese to Market"
Thanks to Deborah Barker, Franklin County (Kansas) Historical Society for research assistance.